i had a busy weekend – we had friends round for supper on saturday and then more friends came for lunch on sunday. sunday lunch was ribs but it was preceded by a meze of dips and flatbread, as was supper on saturday. the reason for choosing dips was the spiced chickpea and sundried tomato purée that aoife from yumbrosia raves about. aoife is my partner in taste and create which is a blogging event organised by nicole, where participants are allocated a partner from whose blog they need to cook something. as ever, deciding which recipe to choose was tricky but, seeing that aoife has a favourites category for her recipes i knew i needed to choose something from here and it was this which first caught my eye. i made three dips - in addition to aoife’s spiced chickpea and sundried tomato purée i made beetroot purée and roasted tomato & red pepper purée, both from skye gyngell’s a year in my kitchen. aoife’s purée was far and away my favourite – the sweet sundried tomatoes add a great depth of flavour to the spiced chickpea mix and i liked the freshness that the lemon adds. heat the tablespoon of oil from the tomatoes in a pan over medium-high heat. add garlic and chilli and sauté until fragrant. add onion and cook, stirring, until browned. add the tomatoes, chickpeas, lemon juice, and spices. simmer together, adding water if necessary, until the tomatoes are tender but a little liquid still remains. 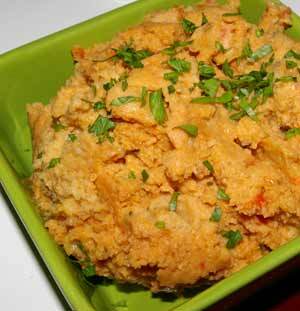 in batches, blitz together in a food processor until the tomato is finely chopped and you have a smooth puree. season to taste. * aoife’s recipe is here, i made a few amendments and the recipe above is my adapted version. * aoife uses curry powder but i didn’t have any so used a teaspoon of a spice mix which i made by lightly toasting, and then grinding, 1 teaspoon of coriander seeds, cumin seeds, fennel seeds, mustard seeds, fenugreek seeds and the seeds of 5 cardamom pods. i also added a bit of ground cinnamon.